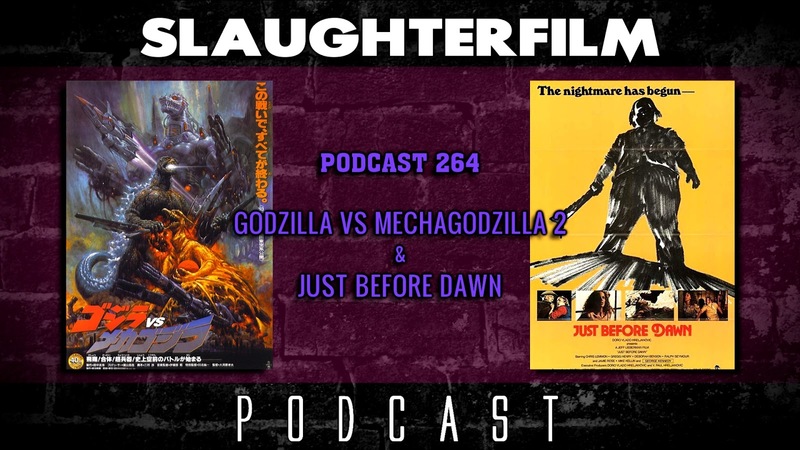 This week Forest reviews yet another Heisei Godzilla film, Godzilla Vs Mechagodzilla 2. Cory kicks off his lake side summer vacation with an early slasher set in the wilderness, Just Before Dawn. The Horror Duo share some old tales of past vacations, complete with cheap Dads and lemon donuts. Also counter productive Friday the 13th experiences and Forest sets a new record for saying the phrase; "whatever like that". Feel free to count while you're listening, OR turn it into a drinking game! For more Slaughter Film news and reviews, as well as show notes and special events, make sure to visit our website; SlaughterFilm.com. 15:44 - "Godzilla Vs Mechagodzilla 2"
26:09 - "Just Before Dawn"